Immense, stretching up to nearly 70 feet long and weighing over 50 tons, the sperm whale is the seventh largest animal, and the largest with teeth, in the world. Prized for centuries because of its oil and the almost supernatural ambergris it creates, the sperm whale today remains vulnerable. And although we have hunted and studied this leviathan for well over 200 years, there’s still a lot we have to learn about Physeter macrocephalus. Female sperm whales reach an average of 36 feet and 15 tons, while males (bulls) average 50 feet and 45 tons. The sperm whale’s huge head can comprise up to 35% of its body length, and inside of that massive noggin is the largest brain on earth – weighing an average of 17 pounds. Now, from this peculiar sideway position of the whale’s eyes, it is plain that he can never see an object which is exactly ahead, no more than he can one exactly astern. The whale’s large bean is also the location of its spermaceti organ – “two gargantuan oil-filled sacs that can constitute up to one-quarter of the body mass and extend one-third of the total length of the whale.” One sac is termed the spermaceti, while the other is called the junk. When spermaceti oil is exposed to the air, it turns into a solid, waxy substance. Wrapped around the spermaceti organ are two long nasal passages, one of which connects to the blowhole, and the other terminates in numerous air sacs. Just inside the blowhole is a valve that may be used to make sounds. That single blowhole is unique, being situated on the left side of the whale’s head. Historically, the sperm whale was hunted for its spermaceti; the waxy substance was used in soap, candles, as oil to burn and as a lubricant. It has been reported that the head of a single whale would yield approximately 500 gallons of spermaceti (or 6 to 8 standard barrels), with an additional 15 to 30 barrels coming from the whale’s blubber. During the two centuries prior to the moratorium placed on whaling by the International Whaling Commission in the 1980s, up to one million sperm whales were hunted. Notably, ambergris, used for centuries in perfumes and as an aphrodisiac, cannot be harvested from a whale. Although the magical substance begins its life in the whale’s intestines, the mass of indigestible squid parts and whale feces must undergo a long, slow process that includes salt water, erosion, sunlight and time, before it is ready to be washed up on shore and sold for $20 per gram. Thus, when a whale is killed, even if it is one of the rare one percent to actually produce ambergris, all the whaler would find is smelly black sludge. Sound generation is a complex process. To make its clicking sounds, a whale forces air through the right nasal passage to the monkey lips [valve], which clap shut. The resulting click! bounces off one air filled sac and travels back through the spermaceti organ to another sac nestled against the skull. From there, the click is sent forward, through the junk, possibly allowing them to aim their clicks. Although sperm whales will eat large fish, skates and sharks, their favorite food is squid, including really large specimens that weigh over 20 pounds. In fact, the whale’s preference for squid is so great, a 1993 study that examined the bellies of 17 sperm whales found the “half-digested remains of almost twenty-nine thousand squid,” and only sixteen fish! To meet its recommended daily allowance, a sperm whale must eat one ton of food each day. Observations of pods have revealed that whales will coordinate hunting over a large area as a group. Sperm whales can dive thousands of feet (up to 6000) below the surface. The average dive lasts about 35 minutes, but whales can stay submerged for over an hour. Nonetheless, as mammals, whales need to surface periodically to breathe, and there have been incidents where sperm whales have suffocated after being caught in fishing lines and transcontinental telephone cables. The sperm whale may be found in every ocean of the world in tropical to sub-polar waters deeper than 650 feet, although it prefers the open ocean and deep, deep water. Bulls tend to roam about and will move up to sub-polar regions, while females and calves tend to remain in sub-tropical and tropical waters. Because of their preference for deep ocean dwelling, scientists are unable to take an accurate census of the sperm whale population. Estimates range from 200,000 to 1.5 million worldwide. Other than man, the only known predators of sperm whales are killer whales and large sharks. Females and calves tend to live in pods of 15 to 20 animals, while bulls swim alone and occasionally are spotted within a group. 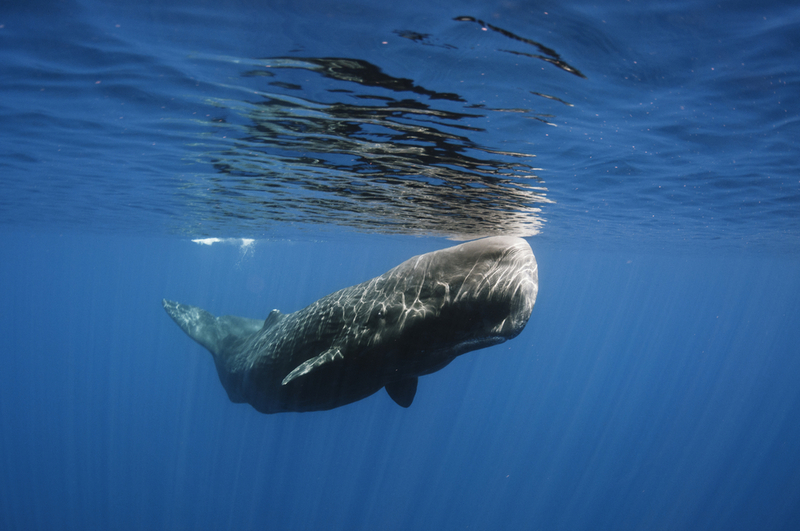 Sperm whales emit clicks and other vocalizations and are often observed engaged in coordinated efforts. Although scientists know that the sperm whale finds squid using echolocation, they are at a loss to explain the lumbering animal’s success. Theories for the sperm whale’s prodigious haul abound. At 3000 feet below sea level, the water temperature is about 40F, and some hypothesize that the cold temperature and extreme pressure render the squid sluggish. Others theorize that the whale’s vocalizations stun the squid and render them easy to catch. Still other wonder if the light color of the whale’s mouth may lure the squid straight into its gaping maw. Although sperm whale communications appear to be sophisticated, scientists are still only guessing at what they’re saying. Researchers have also learned that whales exist within large vocal clans, often made up of “thousands of individuals spread out over thousands of miles of ocean.” In a recent study, it was revealed that different clans use distinct clicking patterns, called “codas,” and that each coda differs slightly among and between individuals. Some have taken these findings to demonstrate that these individual codas are “unique identifiers,” or in other words, names! The precise lifespan of a sperm whale is unknown. However, by examining the teeth of deceased animals, scientists have learned that the species can live in excess of 60 years. 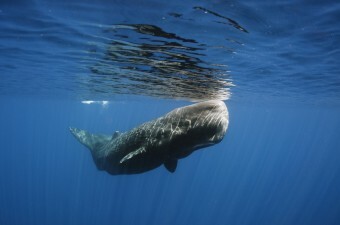 In addition to playing a role in the whale’s communications, other theories for the spermaceti organ have been tested.